Fredrico and Paola moved to Plymouth from Italy. By chance one Saturday, Fredrico and his father-in-law, who was visiting from Italy, stopped by to learn more about Mount Olivet’s chapel. Fredrico, Paola and their new baby Lorenzo visited Mount Olivet again, and found connection in our community as a young family new to the area. They met Mount Olivet member Vicky who just happened to live in their same apartment building. Vicky, a retired teacher has found a new calling as a Grandma. The relationship of support continues, and Fredrico and Paola asked Vicky to be Lorenzo’s American Godmother. A Mount Olivet family generously offered to pay for Bible Explorer registrations for all children at Mount Olivet for this program year. This anonymous gift of close to $5000 is investing in kids and families. We then invited families to pay it forward. Because no registration cost was required, families were invited to share the fee which they would have paid to invest in our community and in our mission at Mount Olivet. Twenty-two families responded—the ripples of generosity continue. A Mount Olivet family planted and tended plots in our community gardens for the sole purpose of sharing the harvest—132 pounds of fresh produce was grown and given to PRISM so families in need could literally eat from garden to table. Director of Worship and Music Angela Gritton connected with Dr. Eileen Guenther, author of In Their Own Words: Slave Life and the Power of Spirituals and Professor of Church Music at Wesley Theological Seminary in Washington, DC. Through connections with Mount Olivet member Diane Dickmeyer and Robbinsdale Community Education, our Mount Olivet Chancel choir will join with Armstrong High School Choir and the Robbinsdale community to present a concert and community sing around Spirituals to celebrate black history month this coming February. Our church is joining voices in the community to sing about the power of love and light to change the world. Each Monday for 52 weeks of the year, Alcoholics Anonymous holds a meeting at Mount Olivet. We are a safe place for people and families in addiction and recovery. We walk with people in transition and trust in God’s healing and wholeness that is found in sharing stories and mutual support. Have you watched our kids run, jump and meander their way up front for the offering each week? They bring delight as their curiosity and eagerness teach us what it means to give abundantly from our hearts. Each year, their pennies and dollars come together so we can share over $3000 for ELCA world hunger initiatives. Mount Olivet kids are teaching us that joy is found in generosity. None of these stories would have happened if our church hadn’t existed here. Your continued investment and engagement help make these and other stories possible and allow us to build community and our future together. Thank you. One integral belief that Mount Olivet Lutheran Church of Plymouth holds is that God is active not just in church, but in our world. We look and listen for what God is up to through the work of our community partners - organizations such as PRISM, Northport Elementary School, and the Home Free women's shelter. Through these partnerships, we have discerned that God is calling us to be a church that works toward feeding people, housing people, accompanying people in transition, and working with faith partners. Nineteen youth and three leaders spent their afternoons on a Summer Service Spree - learning about food insecurity, assisting local partners, and enjoying summertime together! Karen Anderson helped found Plymouth-based nonprofit, Helping Haiti Work, to provide small business loans to women in northern Haiti. Every year, Karen, who is a graphic designer, has created greeting cards that help support the organization and directly fund these micro-loans. This organization is working to end the cycle of poverty in Haiti, and equip women to run their own business. 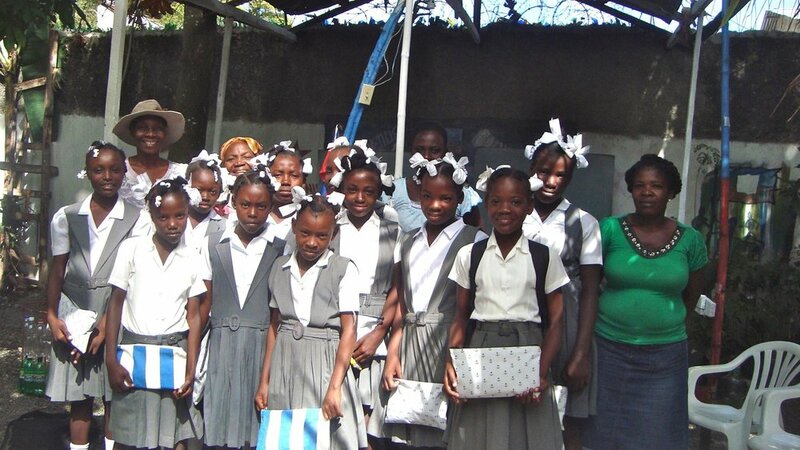 Helping Haiti Work has also equipped two sewing centers, employing Haitian women to construct reusable menstrual pads and diapers, which are then marketed to the Haitian public. And by making sanitary, reusable pads available, girls are encouraged to attend school regularly, even when reaching puberty. "God has given me a real joy in Helping Haiti Work! I pitched in several years ago to help my friend and doctor, Leslee Jaeger, with an idea after her annual medical mission in northern Haiti. Reading how microfinancing women’s businesses can help break a cycle of poverty, we started Helping Haiti Work. It is exciting to be part of this nonprofit from the ground up and to use my graphic art skills for its marketing and fundraising, providing almost 250 small business loans for women in Haiti and equipping two sewing centers. Though I am not one to go into the field, I am able to use the talents I have to make a difference in the lives of some underprivileged families. It is humbling to know how hard our loan recipients work with their $200, and how determined they are to pay back their loans in order to provide for those still on the waiting list. A big thanks to my church family at Mount Olivet for your generous donations that are empowering women and improving communities in northern Haiti"
Camp Noah is an organization started in 1997 by Lutheran Social Service of Minnesota, and grew dramatically as a national program in response to Hurricane Katrina. The camps are locally hosted events for elementary-age children whose communities have been impacted by disaster. With the help and leadership of volunteers, Camp Noah has served over 13,000 elementary school children! MO member, Lisa Hansen, has been organizing Camp Noah teams for the past five years now - following her call to work with children who are dealing with emotional trauma. The children at these camps are given the opportunity to process emotions, and begin recovery after experiencing devastating natural disasters. an immigration raid of an Iowa meat packing plant. But the stories that were told of children’s needs and recovery at these camps lodged a desire to someday serve at a Camp Noah. In 2011, I got my chance. Kirsten Kessel had arranged for Mount Olivet to be part of a Camp Noah program serving the community of North Minneapolis after the devastating tornado there. My daughter, Tori, and I discovered the challenges and joys of working with at-risk kids in a destabilized community. We used every skill and talent we had developed through years of Girl Scouts and Bible Explorers to connect with these kids and communicate the hope that Camp Noah brings to difficult situations. It was exhausting and exhilarating and we were hooked. Camp Noah’s goals and methods were a perfect fit for us. After losing our son, Alex, to suicide in 2012, I personally experienced the echoing trauma of tragedy—as well as the power of the healing compassion that was directed our way. Camp Noah became a way of somehow bringing meaning to my loss and making my pain purposeful. On the three-month anniversary of Alex’s death, I found myself in Moose Lake, MN, serving a small community of children that had experienced a series of big losses, including a flood that had overwhelmed their homes and stolen away their playground. As my small group of children and I worked through our experiences, we healed together. A recommissioning prayer for the new playground demonstrated for all of us the power of resurrection and second chances. Learn more about the planned Camp Noah trip, June 12-17, to St. Charles, MO! Each year, 5th and 6th graders are asked to come up with a year-end mission project that engages them in a way they feel called into the world. Chris Olson and Beth Molitor's group of 5th Grade girls decided to purchase healthcare products for those who are homeless, but they needed help raising the funds to pay for the kits. They came up with the idea of a babysitting fundraising night at MO on a Friday evening; giving parents an opportunity to head out for dinner and enjoy themselves. On Friday April 22nd, the 1st annual “Helping Heroes” Babysitting event was held in the Jungle Room. Approximately 20 kids got 2 hours of dancing, musical chairs, crafts, story reading, and games. Parents got a night out or some time to take care of things. The initial goal was to raise $100, and they ended up raising over $200 towards healthcare products. Thank you to the kids and parents that participated and were able to donate to the cause! Special thank you to Addison, Rachel, Morgan, Linnea, Jessica, and Keira from Club 56 “Helping Heroes” for your leadership in coming up with the idea, working together to make it happen, and making an impact on the Mount Olivet community and beyond!